Asajj Ventress came and conquered the whole of Rattatak with her Master’s Lightsaber. This girl was one of the most feared beings in the galaxy during the clone wars and was responsible of serving the heads of several Jedi warriors. Even Anakin Skywalker’s blow couldn’t kill her and she escaped while disappearing into an unknown place. I guess she escaped and came to earth with a different identity because we got her Lightsaber! After doing some research on it, the original one has been preserved but replicated and giving it to the populace. 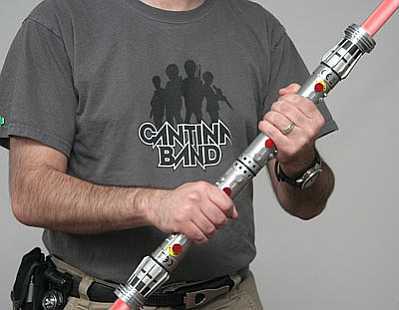 It has named as “Force FX Lightsaber”. Actually the Force FX name also been given with proper justification as these sabers are packed with bajillions of techniques of other galaxy as accurate lights and sounds from the movie. The blades light from the bottom up with sound and fade from the top down also with sound when you want to strike with this. With every wave, each different sound raised when ever saber hitting another saber and gives the complete effect. There are complete different nine sabers are available of each protagonist and antagonist, started with Yoda to Darth Maul , Darth Vader, Obi Wan, Count Dooku, Luke Skywalker, Anakin and along with Asajj Ventress from Star wars. Even Darth Maul comes with an extra one so it can connect two together forms the complete double bladed lightsaber. Even the same style also followed like the movie based on the color of the sabers like Red, Green & blue blades. The 3 AA or 3AAA batteries are required to power it which not included. Every single saber will cost you $119.99 with a dimension of 44” long except the Yoda one, which is 33” long. You can see a demonstration here. You can see some more such Star Wars stuff like Terminator Fuel Cell or the colorful matching Mathmos Space Projector, which will attract you.